While social scientists have described how international conservation has sometimes ignored local knowledge, disrupted already fragile livelihoods, or even dispossessed local people, not as much attention has been paid to the place of the national government in this. In a new book, geographer Hervé Rakoto Ramiarantsoa and colleagues point out (among other things), how ‘ecopower’ is today largely in the hands of international actors (bilateral and multilateral donors, large environmental NGOs, mining corporations), pushing out the weak and troubled Malagasy state to a secondary, subservient, but omnipresent role. The edited volume* printed on ultrathin paper comes out of two mini-conferences sponsored by the French international development research agency (IRD), one at the Université d’Orléans in 2009 (link), and the other at the Université d’Antananarivo in 2010 (link1, link2, pictures below) . The chapters cover diverse terrain; here are some of the main themes that caught my eye. The Introduction (Chantal Blanc-Pamard, Florence Pinton, Hervé Rakoto Ramiarantsoa) highlights the role of international environmental agencies and organizations in globalizing the ‘nature’ of places like Madagascar, and in doing so sacrificing rural livelihoods. They introduce a geopolitical approach based on a trio of interrelated concepts: norms, actors, and territories. Chapter 1, by Stéphanie Carrière and Cécile Bidaud, presents a good critique of how the environment – and how we think about it, categorize it, label it – is constructed by conservation scientists, and is always political. They investigate concepts such as ‘wilderness’, ‘primary forest’, and ‘corridors’ and how they shape certain types of thinking, certain kinds of interventions. (In her conference presentations, Carrière showed with particular alacrity how the new buzzword of ‘conservation corridors’ was too readily latched onto in Madagascar, largely because it geographically fit the elongated form of the remnant forests, rather than due to any ecological processes.) In effect, Carrière and Bidaud show how a certain kind of conservation thinking, largely of an ‘anglo-saxon’ origin and centered in biocentric fetishism of ‘naturality’ at the expense of human-shaped agroecological landscapes, has replaced an earlier, colonial, French hegemony (demonstrated in part through the analysis of authors in the benchmark book Natural History of Madagascar edited by Goodman and Benstead, or through the conflicts they witnessed between francophone and anglophone epistemological communities involved in the Durban Vision group tasked with expanding the protected areas network after 2003). Interestingly, they assert that the choice of conservation tools (corridors, protected areas) isn’t made on the basis of universal scientific knowledge, but instead lots on a strong political will to create protected areas to respond to the expectations of the international community. Chapter 2, by Philippe Méral, takes an ‘international political economy’ approach to analyzing bilateral and multilateral aid politics. His thesis is that Malagasy environmental policy cannot be understood without taking into account outside influences. He documents the 1990s boom in African environmental action plans, and the way in which American funding very much focused on the environment while the French not. His chapter reviews the evolution of Madagascar’s National Environmental Action Plan from integrated conservation and development in phase 1, towards community-based approaches in phase 2, and back towards the Durban vision and a top down approach in phase 3, and the reasons for these swings. He argues that the current promotion of REDD and other payments for environmental services is the result of globalization of environmental issues and the displacement of the centre of gravity for decisions on these matters outside of Madagascar. Chapter 3, by Ramarolanty Ratiaray and Saholy Rambinintsaotra, both law professors at the University of Antananarivo, is a useful review of history, policy, and current situation of land tenure in Madagascar. They then apply these ideas to questions of customary rights, protected areas, and land grabs for industrial agriculture (e.g. the Daewoo deal in 2008). They argue that the new 2005 land tenure act is quite important, but not really in practice yet. They trace the consequences of its shift in presuming land to be in the public domain to a presumption of private domain. They critique the way the central government overrode the regional/communal land tenure offices in giving away land, and promote a principle of free, prior informed consent in things like protected areas and land delimitation. My Chapter 4 (pdf 3Mb), the fourth one, reviews the contributions of (largely Anglophone) political ecology research to investigating Madagascar’s “environmental question”. I review four main themes in the research: analyses of conflicts over natural resources, the analysis of dominant environmental discourses, multi-causal investigations of environmental change, and analyses of environmental institutions and actors. I make several suggestions for lacunae in the political ecology research agenda, all of which are now somewhat dated. These include attention to environmental questions not necessarily linked to forests and parks, like extractive industries and urban pollution; attention to the role of the Malagasy state; and attention to the important role of international capital flows, whether investments, extraction, or linked to payments for environmental servces like REDD. Chapter 5, is by the agronomist and modeller Dominique Hérvé. He discusses a number of different kinds of dynamic environmental models that he sees as policy tools – such as those dealing with forest cover, with institutional control, or with rural household economics. 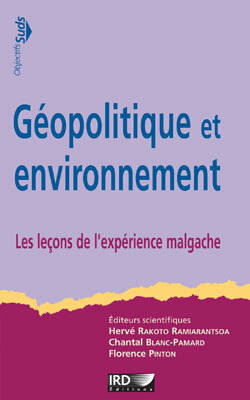 Chapter 6, by Bruno Ramamonjisoa of the University of Antananarivo’s forestry school (ESSA-Forêts), carefully reviews several theories (or analytical frameworks) for analyzing governance, and then applies them to Madagascar, showing how environmental governance has gotten much more complex. There used to be three main actors – the state and its services, large agribusiness and forestry actors, and rural communities. Now there are more – the political state, technocratic state, NGOs, donors, villages, economic actors… He reviews some of the institutions and committees that governed decision making during the 1990-2009 era of the Environmental Action Plan, and their power and composition. He asserts that the strategy of going around the state began with this Plan. Those who have the money – like foreign donors or commercial operators – are in the end the ones that have the decision making power, whether through formal or informal channels. Chapter 7, by Estienne Rodary, shifts our regard from the usual Euro- or American- centric one, and reviews the relationship of Madagascar with South Africa. It contains a very useful summary and perceptive analysis. Despite intentions on both sides to build links, South Africa’s view has always been terrestrial, towards the countries which are accessible to it by land. And Madagascar has always had the strong French presence (and others, i.e. American in conservation, Chinese in imports) that prove too strong competition for the South Africans. Chapter 8, by Aimé Lala Razafinjara, member of the Academie Malgache and Directeur Général of FOFIFA, reviews the state of government-led rural development and agricultural research on the island. He shows how agencies like FOFIFA struggle to research topics and methods of interest to them, as they have very little recurring budget of their own. Their research agendas are strongly shaped by the funding of by international ‘partners’ on current themes of interest to the partners (he reviews a smattering of recent trends, like carbon, no-till agriculture, biocontrol or industrial insecticides for locusts, biofuels). Chapter 9, is by Jean Roger Rakotoarijaona, who co-leads the national technical committee for REDD and led the preparation of Madagascar’s Readiness Preparation Proposal (R-PP). He presents a historical and sharply critical review of Madagascar’s environmental politics of the past few decades. Then he introduces the ‘REDD’ tool for financing environmental management, arguing that it has potential as it is more results-based than the flawed previous programs and strategies (because payment comes only upon reaching success). His chapter reviews the status of REDD in Madagascar and asks good questions about the risks uncertainties of a REDD approach. The Conclusion (Hervé Rakoto Ramiarantsoa, Chantal Blanc-Pamard, Florence Pinton, and Samuel Razanaka) usefully ties together the diverse contributions. It contains the material cited in my introduction about ecopower and the diminished role of the state. They further point out (p. 277) that the state is present across the categories of ‘customers’, ‘actors’, and ‘owners’ of environmental actions, but is never the primary beneficiary, operator, or director. This entry was posted on Tuesday, January 8th, 2013 at 9:21 pm and is filed under Book Review, Development, Madagascar, Political ecology, Research. You can follow any responses to this entry through the RSS 2.0 feed. You can leave a response, or trackback from your own site.